This website is a portal to an Open Numerical Turbulence Laboratory that enables access to multi-Terabyte turbulence databases. The data reside on several nodes and disks on our database cluster computers and are stored in small 3D subcubes. Positions are indexed using a Z-curve for efficient access. Access to the data is facilitated by a Web services interface that permits numerical experiments to be run across the Internet. We offer C, Fortran and Matlab interfaces layered above Web services so that scientists can use familiar programming tools on their client platforms. Calls to fetch subsets of the data can be made directly from within a program being executed on the client's platform. Manual queries for data at individual points and times via web-browser are also supported. Evaluation of velocity and pressure at arbitrary points and time is supported using interpolations executed on the database nodes. Spatial differentiation using various order approximations (up to 8th order) and filtering are also supported (for details, see documentation page). Particle tracking can be performed both forward and backward in time using a second order accurate Runge-Kutta integration scheme. Subsets of the data can be downloaded in hdf5 file format using the data cutout service. 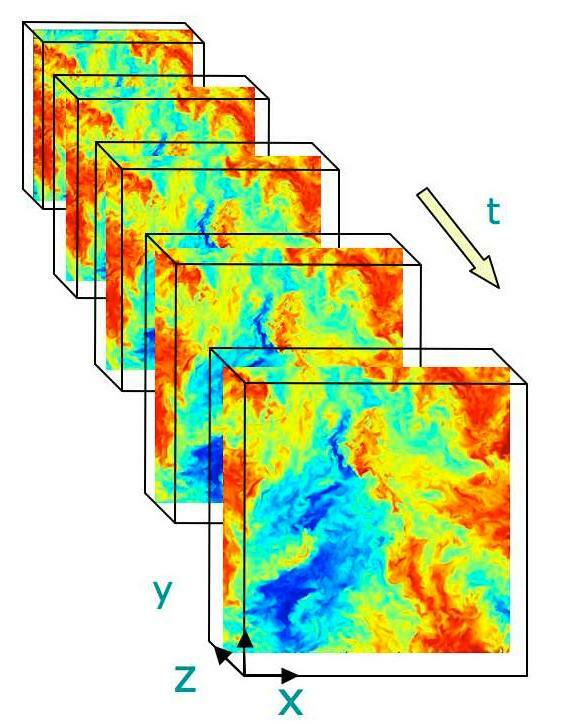 To date the Web-services-accessible databases contain a space-time history of a direct numerical simulation (DNS) of isotropic turbulent flow in incompressible fluid in 3D (100 Terabytes), a DNS of the incompressible magneto-hydrodynamic (MHD) equations (50 Terabytes), a DNS of forced, fully developed turbulent channel flow at Reτ=1000 (130 Terabytes), a DNS of homogeneous buoyancy driven turbulence (27 Terabytes), and a transitional boundary layer flow (105 Terabytes). Also available are individual snapshots (spatially but not temporally resolved data) of 40963 DNS of isotropic turbulence (1 snapshot) and rotating stratified turbulence (5 snapshots, 5 Terabytes), and channel flow at Reτ=5200 (11 snapshots, 20 Terabytes). Basic characteristics of the data sets can be found in the datasets description page. Technical details about the database techniques used for this project are described in the publications. The JHTDB project is funded by the US National Science Foundation . JHTDB is also supported by the Institute for Data Intensive Engineering and Science . JHTDB data may also be accessed via SciServer resources . Disclaimer: While many efforts have been made to ensure that these data are accurate and reliable within the limits of the current state of the art, neither JHU nor any other party involved in creating, producing or delivering the website shall be liable for any damages arising out of users' access to, or use of, the website or web services. Users use the website and web services at their own risk. JHU does not warrant that the functional aspects of the website will be uninterrupted or error free, and may make changes to the site without notice.